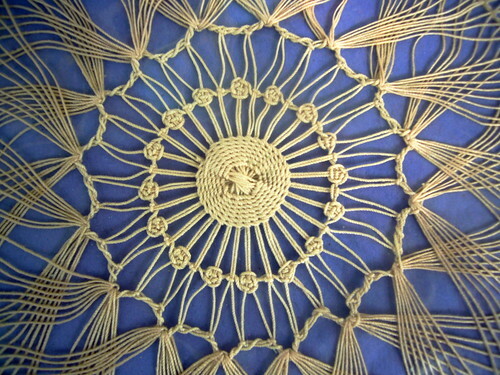 I was inspired to learn more about Teneriffe lace by a post on the Craft blog called How to Make a Spider Loom for Lace. Their example didn’t look like any kind of lace I’d seen. I had considered tatting as a craft for this blog (and may yet to get to try it) and I knew that there was a kind of lace one could make using pins, but the idea of a loom for lace was new to me. A bit of Googling turned up Teneriffe lace, also called Polka Spider Web lace. A bit more Googling about lace blew my mind. I had thought that tatting was the word for making lace. I was very wrong. There are a zillion different kinds of lace. Check this out: The Structures of Antique Lace. Teneriffe and tatting both come under the Other Handmade Lace category, if that helps show how wrong I was. One other great resource I found for Teneriffe is this awesome book from 1904 called Teneriffe Lace Designs and Instructions. I hope to try some of those designs but right now they all look too daunting! This week I’m going to try my hand at a form of lace making known as Teneriffe, a knotted lace. I’ll show you how to make a loom, where to find designs, and how ignorant I’ve always been about types of lace. I hope you’ll check back for my progress! Many thanks to Jenni for including my little chocolate project in her PMAT Live video series! So our tasty chocolate would not temper. What would we do with all of that shiny lusciousness? Jenni came up with the brilliant idea to make truffles. We added cream and let the whole thing firm up in the fridge. Then we rolled marble sized portions and coated them in one of three toppings: powdered sugar, cocoa powder, or chopped nuts. Finally we had yummy little nuggets of our own handmade chocolate. They were delicious! I hope that you will try this yourself one day so you can experience the amazing range of flavor that chocolate can have. We had thought that we would add flavorings to it but it was so complex that we didn’t need to. – Making chocolate by hand is messy and has a lot of steps, but it isn’t that complicated and the end result is amazing. – Raleigh folks can buy your beans at Escazu. If I had known this before I bought online I probably would have done that instead. – That said, the Chocolate Alchemy site has lots of great information for people making chocolate at home. – I will probably do this again! As I said yesterday, we had enough cocoa beans leftover to try a second batch after we over roasted our first set of beans. This time we were armed with better information and that made us confident enough to try a larger batch. So we measured out 200 grams of beans and roasted them until the skins just started to pop. Then we peeled them all by hand. The original instructions had said that you could crush the beans and use a hairdryer to remove the papery skins, but peeling them by hand isn’t too difficult so we did it that way again. We were left with a bowl of much better smelling peeled cocoa beans. Then we put our sugar in the blender and processed it alone so it would be a finer powder and would incorporate better into the beans. That was fun. We chose to make a 65% cocoa batch of chocolate, so we measured enough sugar to make up 35% of the whole batch. A kitchen scale is a valuable tool for this step. We started in the Blendtec but ended up switching to a food processor for the grinding step. For some reason the chocolate kept getting hard underneath the blender blades and made the machine stop working. If you do this at home we highly recommend a food processor for the grinding step. It is amazing to me that the dry roasted bean can produce so much moisture during the grinding process. We did add a little bit of extra cocoa butter to help it along, but not more than 10%. As fun as the mortar and pestle were for conching the smallest batch, we decided to use a good stand mixer for this step in batch #2. Jenni tells me that commercial chocolatiers will conche their chocolate for as many as 72 hours! We gave ours a good 30 minutes while we went out to see the neighborhood chickens. So if it wouldn’t temper, what would we do with our yummy chocolate? Check back tomorrow to find out. There are really very few steps involved in making chocolate. Unfortunately, if you screw up one step it may negatively impact your ability to get to the last one. We seriously overroasted our first batch of beans. I blame inexperience coupled with bad advice. You would not believe the horrible smell that was involved in every single one of the steps shown above. In the end we had to throw our first batch away. Fortunately we had plenty of beans left and the resolve to try it again. Our next try was a larger batch requiring different equipment. Check back tomorrow to see what we recommend for those of you who want to try this at home. A few months ago I found a post on the Instructables web site that mentioned how easy it is to make chocolate from scratch. It had never occurred to me that this was something people might do at home. I immediately contacted an online acquaintance who is a local food blogger to see if she would be interested. Jenni is the brains behind The Balanced Pastry Chef. She is hosting me this week so we can figure out if this chocolate making thing is something that people really can (or should) do in their kitchens. Above you can see our materials. I bought a pound of cocoa beans from Chocolate Alchemy. John has a great selection of beans on his site and tons of information on chocolate making. I chose his La Red beans from the Dominican Republic because he said that they were very forgiving for beginning roasters. We also need sugar and some cocoa butter (optional, for texture), which I bought in the health and beauty section of the grocery store. I’ll show you how we used the rest of the equipment tomorrow when I share our chocolate making steps. Check back and see our failures and (hopefully) successes! You are currently browsing the 50firstcrafts blog archives for October, 2011.